Fresh food with a smile, looking after your every need. Leek and potato soup served with fresh bread and a selection of dips and spreads including chicken liver parfait, mushroom pate and harissa hummus. Treacle and juniper cured roast sirloin of beef. Served with creamy mashed potatoes, garlic and thyme roast potatoes, salt baked celeriac, honey glazed carrots, balsamic roasted beets and gravy finished of course with a yorkshire pudding. Ginger bramley apple and honey plum crumble with a mixed cereal and nut topping served with a selection of vanilla ice cream, creme anglaise and honey comb shards. Morrocan lamb koftas served on tabouleh with a yoghurt and mint dressing. Moroccan flavoured haloumi served on tabouleh with a yoghurt and mint dressing. Lamb tagine served with pommegranite cous cous, spiced carrots and flatbreads. Squash and puy lentil tagine served with pommegranite cous cous, spiced carrots and flatbreads. Thai fish cakes served with zingy slaw and tomato jam. Beef wellington, Beef fillet wrapped in a mushroom duxelle, prosciutto and puff pastry, served with dauphinoise potatoes, celeriac puree and honey glazed carrot and parsnips. Finished with veal jus and root vegetable crisps. Potted shrimps served on a toasted blini with pickled cucumber and sesame sauteed baby beetroots. Roasted lamb neck served on buttery glazed roast potato slices with a lamb kidney, leek and carrot stew. Topped with pickled red cabbage. Braising oxtail served on corned beef hash with real gravy topped with celeriac crumb and a fried duck egg. Pan fried trout with sauteed new potatoes, samphire, and truffle roasted cherry tomatoes finished with a saffron and orange butter sauce. 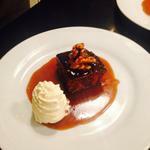 Grasmere gingerbread topped with apple and cinnamon ice cream and accompanied by red wine Kendal mint cake sauce. Beetroot cured salmon on toasted pumpernickle bread with a horseraddish and pickled cucumber cream topped with caviar. 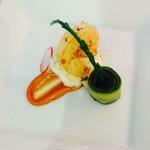 Cajun flavoured lobster tail served with a pine nut podi, avacado mayo, cauliflour puree, smoked oil and gumbo sauce. White truffle tagliatelle topped with a parmesan crisp and toasted walnuts. Rack of lamb-morrocan spiced with a tagine flavoured jus, pickled apricots, anchovie and almond crumb and duchess potatoes. Pistachio crusted rose water marshmallow. Chocolate and beetroot torte, topped with sweet avacado cream, chocolate soil and honeycomb. A selection of local cheese served with crackers, chutney, nuts and dried fruit. Pan fried sweet chpotle chili king prawn served on celeriac slaw in a parmesan cup with a sprig of samphire. Scorched cured makerel sreved with asian slaw, pea and wasabi puree and pickled cucumber. Ham hock and cornichon terrine rubbed with english truffle oil in a wild mushroom broth topped with a poached quail egg. Black pudding served on calvo nero bubble and squeak topped with a poached duck egg, english mustard cream and crispy panchetta. 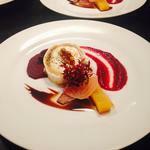 Whisky flamed goats cheese served with candied walnuts, beetroot ketchup, balsamic glaze and roast beetroot compote. Confit hake served on fennel and aubergine caponata with a roast fondant potato and sweet red pepper sauce. Slow roasted pork belly served with a roast fondant potato saute savoy cabbage and panchetta with a squash puree crispy braised pig cheek and puy lentils in a rich jus. Portobello mushroom stuffed with bean tapenede and topped with melted rarebit served with a roast fondant potato squash puree and fennel and aubergine caponata. Crispy bone marrow mac and cheese served with a romescu dip. 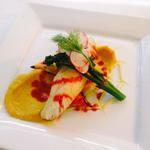 Asparagus topped with a poached egg, hollandaise sauce, parmesan crisp and a spinach cream. Confit duck and kimchi spring roll served with srirscha slaw, chicory and plum sauce. Pea fritter topped with potted shrimps served with avacado butter and picco di gallo. Rack of lamb served with tahini daupinoise potatoes, salt baked carrot and beetroots, balsamic glazed shallots with a madiera jus. Pan fried duck breast served on confit duck leg and chorizo hash with confit tomatoes and a red wine, chilli and spring onion jus. Goat cheese and sun blushed tomato roulade sreved with chilli jam and salt baked carrots and beetroots. Chocolate mousse with layers of creme patisierre topped with chocolate shavings. Apple, blackberry and ginger crumble, with a mixed cereal top, creme anglaise and ginger ice cream. 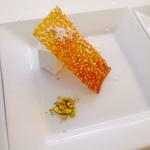 Passion fruit creme brulee with almond sable biscuit. Using La Belle Assiette couldn’t be easier, any questions that we had about our booking were answered quickly by knowledgeable and friendly staff. We chose the design your own gourmet menu, this meant speaking to Chef Michael Thomas who then provided us with a number of options per course to choose from and who was happy to tweak our menu accordingly. 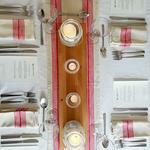 Chef Michael Thomas made our dinner party truly special. As well as creating some sensational food, he was professional, friendly and a delight to have around. Our guests loved the experience of being served at the table by Michael who explained each course. An experience highly recommended and definitely to be repeated. Michael's food was incredible, every steak was cooked to perfection and each item on the plate was exceptional. Michael's friendly, personable and flexible to the party's needs. Overall, we had a great night. I would have no hesitation in recommending the company and particularly the chef, Michael Thomas. The food was beautifully presented and tasted just as good as it looked. I look forward to using the the company again. Michael was absolutely great! Such a friendly and accommodating chef and the winners had an amazing time. Chef Michael Thomas was fantastic - he called the week before to discuss all the details, turned up on time, cooked us a fantastic feast, and cleaned everything up. The food was of a very high standard, he's a very nice friendly chap, and we all thoroughly enjoyed the evening. La Belle Assiette were very responsive to my email enquiries, and the booking process went without a hitch, although I did find it slightly disconcerting to pay in full upfront without speaking to anyone. I could have called them had I been that worried though! From initial contact, Chef Michael was flexible, accomodating and friendly. He changed the menu to suit our needs and ensured that on the night we had a wonderful experience. The food was some of the best we have ever eaten, we would highly recommend Michael and are looking forward to booking him again. Micheal provided a Class A service, from liaising regarding the menu to the actual event. The 5 courses were heavenly and cooked to perfection. 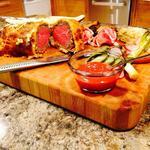 Having not used a personal chef before I would not hesitate to book again. We booked Mike for my Dads 60th birthday for 9 people, we had several fussy eaters and wanted to change the starter for a few of the guests, after speaking to Mike after booking, he said it would be no problem to make a change and got back to us with some delicious alternatives. A friendly guy and a very competent chef! The quality of the food was excellent and the flavours were superb. The personal highlight was the bloody Mary sauce on the mussel starter. The steaks were all cooked perfectly to our individual liking and the presentation of each dish was great. Would not hesitate to recommend. The booking was also hassle free through La Belle Assiette. Thanks again. Michael cooked us a beautiful meal , which he served in a friendly and professional way. Everyone enjoyed the food which was fabulous. I cannot recommend him highly enough. We had a lovely evening. Micheal quickly familiarised himself with the kitchen and then worked away, no fuss, always helpful and polite. For a family with a new baby this was a very good alternative to eating out and one that we would certainly choose again. 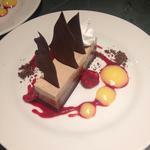 The food was excellent, the quality of the ingredients and the skilful cooking was outstanding. We particularly loved the white truffle tagliatelle and the Moroccan rack of lamb, one of the nicest lamb dishes I’ve ever had. Micheal gets 5 stars on all counts, and a big thank you! Our chef Michael Thomas was just brilliant, he cooked us the most fabulous meal for my husbands birthday. He was so helpful in providing alternative starter options for us and everything he cooked for us was done with such ease and tasted absolutely delicious.... better than any restaurant we have been to for a while! We had a fabulous experience and will definitely be doing it again! This was the first time any of us had ever had a private chef and the whole experience completely exceeded expectations. Michael was excellent, very friendly, great food and we all commented after that we'd definitely do this kind of event again. 5star food in your own home with no effort - couldn't ask for more. What an experience....we had Michael Thomas as our chef and he was amazing! The food he prepared and cook for us was delicious, it was such a treat to have great food in your own surroundings. Mike was a real professional and was busy in the kitchen whilst we got on with our evening and he cleaned the kitchen. Would absolutely recommend this service. Michael Thomas was a fantastic chef and very professional. The food was outstanding, well presented and generous portion sizes. The whole evening exceeded our expectations. Thank you! putting everything away and tidying up. Great service and who knows we may use you again in the near future. 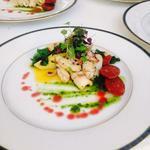 The overall booking process was very easy and the chef got in contact before the event to finalise the menu. Michael was very accommodating when catering for a dairy free diet and was able to do this within the required cost base, whilst also making it tie in with the rest of the diners plates. On arrival Michael was very polite and kept us up to date on progress and timings for sittings. He presented each dish beautifully and introduced each course, providing the overview of what each was. The kitchen was left spotless (cleaner than when we arrived in the cottage!). I would definitely use this website again and would highly recommend Michael - amazing food, provided by a polite and professional chef! 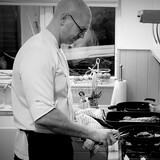 Thank you to our chef Michael Thomas who prepared a superb dinner for us at our friends house. It was the first time we have had an experience like this and I would definitely recommend it to anyone. Micheal was very friendly and professional. The food was beautifully presented and all courses were delicious especially the braised pigs cheeks and the lemon and elderflower cheesecake which was to die for!! It was certainly an experience to remember and we loved every minute of it - thank you Michael!! My food is vibrant and packed with flavor, I love spices and using fresh ingredients. I like to use influences from all over the world and like to do something a little quirky at times to put my own stamp on a dish. Eggs because the list of things you can make with them is endless. Salt because it brings out the flavor and transforms food into something much tastier. 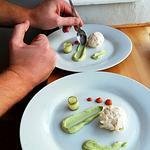 I am a private chef because I like the challenge of a new destination and menu on every job I do. It's great to meet customers face to face and interact with them while bringing them a memorable experience. If you believe this content violates or infringes your rights, Michael Thomas may not know. You could solve this problem by contacting him.